*You get to choose your 6 dates for your flexibility! 5-6 : Red Ball - 36' Court: 3 p.m. - 4p.m. 7-8 : Red Ball - 36' Court: 4 p.m. - 5 p.m.
9-10 : Orange Ball - 60' Court: 5 p.m. - 6p.m. Tons and Tons of Fun! 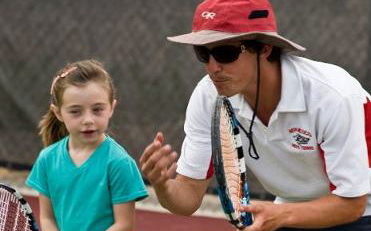 Chris has coaching tennis since 2007. He is both ANTS and PTR certified in 2007. Chris has a masters degree in Osteopathy. While coaching at Virgin Tennis in London, Chris ran performance squad sessions as well as helped develop and run programs to get local children into playing tennis. Chris first picked up a tennis racket at the age of 4, in a similar program to ANTS, and has been playing ever since! At his high school in England he played on the U-18 team from the age of 13, and competed at a high level in county competitions. Before moving to the US in 2011, Chris was a coach and club captain of West Surrey Tennis Club (possibly the youngest ever at 25!). He was instrumental in integrating junior players into adult teams. Chris has a real passion in encouraging people to become active, and tennis is a great way to do that! Add an ANTS age appropriate racquet for ONLY $25.00. Age specific racquets are mandatory in ANTS Tennis because they not only allow for more enjoyment but also provide a better learning experience.